Playing guitar on left in white hat. 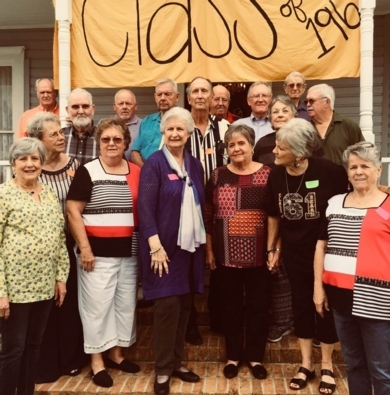 Class of 1961 reunion held at the Wiley Hotel in Garrison on weekend of Sept. 29, 2018. Photo courtesy of Cecilia Wharton. 17 Timpson High School Class of ‘61. Back l to r: Calvin, Dale, Charles, Dow, Jerry, Bobby, Hal, Joe, Jimmy Lee. 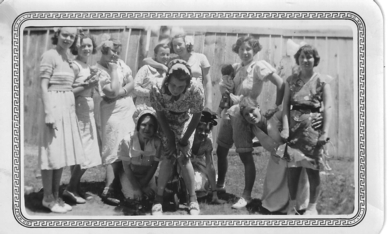 Front l to r: Billie Sue, Judy, Elizabeth, Johnnie Sue, Arlene, Cecilia, Janeice, Peggy! Courtesy of Betty Whiteside Shields. 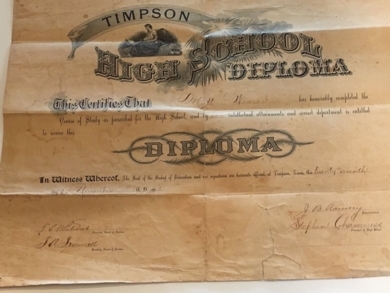 This is her grandmother’s diploma-Mytt Weaver who graduated in 1902 from a Timpson High School. She married Thomas Pierce Whiteside and had at least four children...Helen, Russell, Blanche and Rundolph. 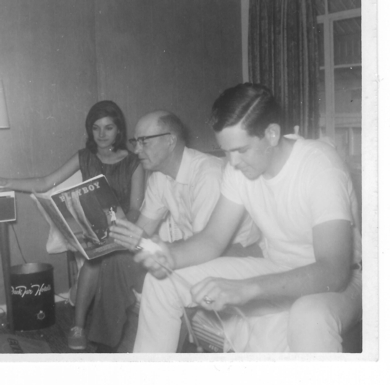 1965- Class Senior trip- L to R... Miriam Hudman, Mr. Cecil Wharton and Freddy Wharton at Jack Tar Hotel. Mr. Wharton was long time Ag teacher at Timpson from th late 1940s to early 1970s. He had five children to graduate from Timpson High School. I doubt very seriously that was the cover of a magazine he was reading but an advertisement to buy the magazine. Photo courtesy of Ken Smith. Timpson Times-May, 1940. Courtesy of TAGHS. 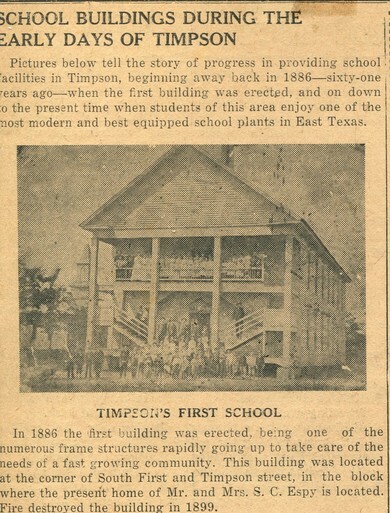 1885-Nov. 5- First edition of The Timpson Times published. 1886-Bar-B-Cue held at Timpson-more than 3,000 attend. 1886-Jim Truitt, editor of Timpson Times murdered. 1887-Whiskey people win in Timpson...211 in favor...114 against. 1890-Timpson incorporated. JE Blankenship elected first mayor. 1894-Mrs. Albert Durambus and two children murdered and house burned. 1895-Summer Normal school ended in Aug. Attendance of 65 for summer. 1895-Charter filed for Timpson Hardware/lumber co.
1895-Railroad from Timpson to Carthage approved. Will be built under TS Garrison. 1901-Fire destroys most of downtown Timpson. $225,000 in damage. 1902-Company B of Third Infantry organized at Timpson. Captain JD Jennings as commanding officer. 1903-10 miles south of Timpson. Feud between families of Chapman, Hanks and Prince families. Gunfire erupts...1 dead, 2 fatally wounded, 1 seriously wounded. 1904-School term cut in Timpson due to lack of funding. 84 girls and 4 boys graduate. 1906-Captain TJ Todd, pioneer and former mayor of Timpson dies. 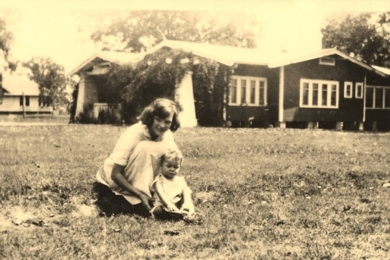 1907-Bond issued approved for $9,000 for new addition to school. Lumber yard fire at mill in Stockman. Timpson High School affiliated with Texas A&M. Meaning no test is required for student from THS to be admitted. 1908-JD "Dollar Mayor" dies. Editor of Times and mayor of Timpson. 1909-Located 10 miles west of Timpson, fire at Bagley Lumber causes $100,000 in damage. First "East Texas Fair" held in Timpson. 1910-Timpson Soda & Mineral Water Co. files a certificate of dissolution. Timpson HS opens late due new bldg. construction. New auditorium will seat 700. Fire destroys 7 or 8 old business houses on South First St.
Telephone Co. Installed & lots of surrounding community residences have phones. 1911-Simpson's Mill boiler explodes. Located 8 miles south of Timpson. 2 killed and 8 injured. Borgard & Son erect bldg. on South First St. To use as warehouse..
Fire destroys Keelman & Coleman bldg and JH McGauhy bldg. Timpson Bottling Co & received its new ice cream machine & installed. School kids expected to be brought by train on a Saturday to go to Fair. 1912-NM Addison appointed postmaster at Blair. 1913-Gulf Pump Station built in Weaver. 1914-Timpson bond issued passed. $17,000 for water works and $10,000 for cement sidewalks. 1916-Company B at Harlingen, TX with over 100 members. The Captain is RR Morrison. Into woods without any money. 1917-Co. B arrives back in Timpson after 10 months on border. Greeted by 2,000. 1918-Pvt. Jodie M. Ferguson from Timpson fatally wounded in WWI. 1919-W. H. Butler elected Superintendent of Timpson High School. State mandated construction on 7 dipping vats to be built around Timpson. Timpson Boy Scouts celebrate their anniversary at Methodist Chuch. 1920-Crown Theatre sold by G.T and G.W. Trammel to W.H Powers. 1921-J. Preston Crimm starts Timpson school year as Superintendent. 1928-Dr. TF. Whiteside dies. Part owner of Whiteside-Johnson Hospital in Timpson. 1931-Timpson wins district in football. Plays and loses to Crockett in Bi-District..
1932-City tax rate dropped from 1.25 to 0.75 cents making Timpson having one of lowest rates. 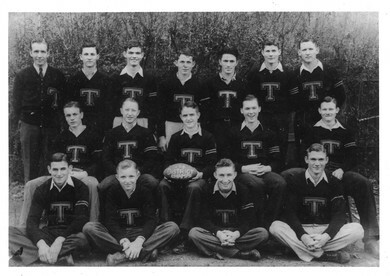 1934-Timpson wins district in football for second time. Plays and loses to Mineola in Bi-District. 1942-Mrs.. Maudell J. Spencer appointed acting Postmaster at Timpson during the war. Annual Christmas Parade canceled due to wartime economy. School ends two early due to National defense....in March the school went to six day week. 1955-Costruction of Lake Timpson starts on Jan. 4, 1955 and finish in late 1956. 1958-Timpson goes to Bi-District for third time. Loses to Leveretts Chapel. 1965-J.E. Blankenship dies . (1872-1965) first mayor of Timpson and leading merchant. . The Class of 1947....think picture was taken in 1946-1947. 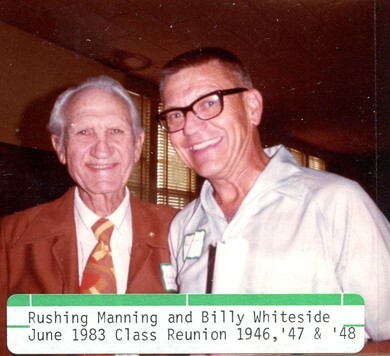 We were saddened to learn of the passing of Billy Whiteside from the Class of 1948 on May 26. Billy resided most of his adult life in Corpus Christi. Billy will be missed by all that knew him. God Bless Billy and his family. The picture below is courtest of Marian Hooper Bodiford from the Class of 1947. Rushing Manning was a Ag. teacher at THS in the 1940s and also served as a state legislator during this time. 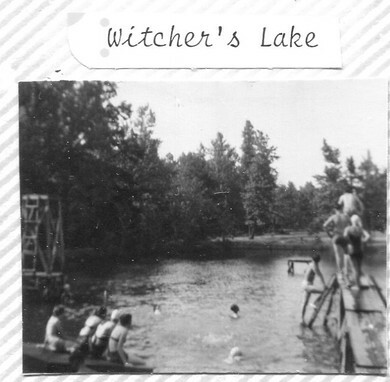 Witcher's Lake-Photo courtesy of Marian Hooper Bodiford from the Class of 1947 which was about the time the picture was most lkiely taken. As with most research, I am sure there are mistakes. Please let us know any so that we may correct. Second time to win districts. The team lost the bi-disrict game to Mineloa 0-31. Coached by Carlos "Smiley" Davis. Season record was 5-3-1 including bi-district loss. Back row-second from left is Arthur Horton. 5th person is Alford Richards. Middle row-4th person from left is Sherrill Bailey, 5th is Woodrow Smith. This picture was sent to us by Kenny Smith-Class of 1965. Kenny obtained it from the Alford Richards' estate. To see two videos of the THS Marching band. Click here Then find the two videos of THS Band. The vintage videos are two videos of the THS marching band 1974 drum major Rene Graves and 1975 Drum major Debi Edwards (Amos). Stephen Amos from the Class of 1975 sent us the link. You may have to download the free Quicktime to view. Some people have lost their yearbooks or never had one. 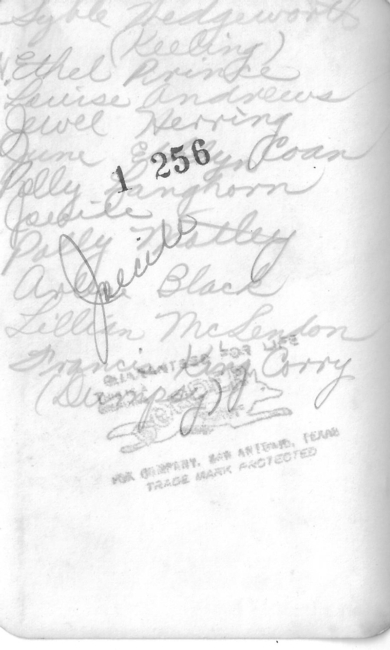 Thanks to Billy Askins, Monica Eakin Fitzgerald, Shannon Armstrong Menefee, Summer Warren Ramsey, Linda Billingsley Amos, Beverly Williams Taylor, Carlos Gray, Kathy Magness Grisby, Roma Faye Ceal Molloy, and the Timpson Area Genealogical and Heritage Society(TAGHS) for use of their yearbooks to scan. Just go to Classmates by Year and click on the year or click on year below to view. Please not the following years did not have yearbooks so we put in articles from old Timpson Times to serve as a yearbook for these years: 1948, 1951, 1952 and 1953. 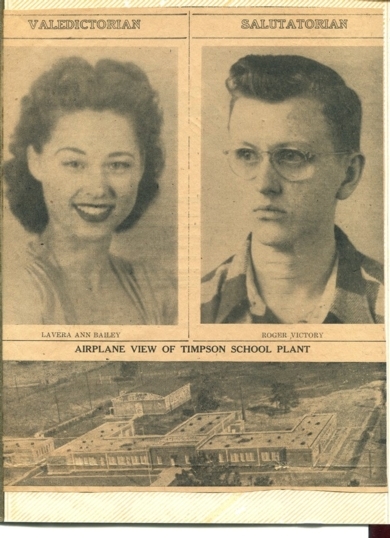 Welcome to the Timpson High School 1945-2011 FREE website sponsored and administered by the class of 1966 and 1968. If you know of any classmate who has not yet registered on the site, please contact them or provide an e-mail address on the Home Page and an invitation will automatically be sent to them by the website. Thanks for your assistance in making this a fun way of all staying in touch and reviving old friendships or starting new one because of revealed unknown life experiences. If you have any info to share about our teachers, please "Contact Us" by e-mail on the far left side (above "In Memory" ) so that we can include the information on their profiles.